Right now, at this very moment, I am making the brightest-tasting tart ever to be enjoyed in February, but there’s a lull in the process as my crust and my custard are cooling. I’ll tell you about it tomorrow. I say that a lot. I said it about the burdock. 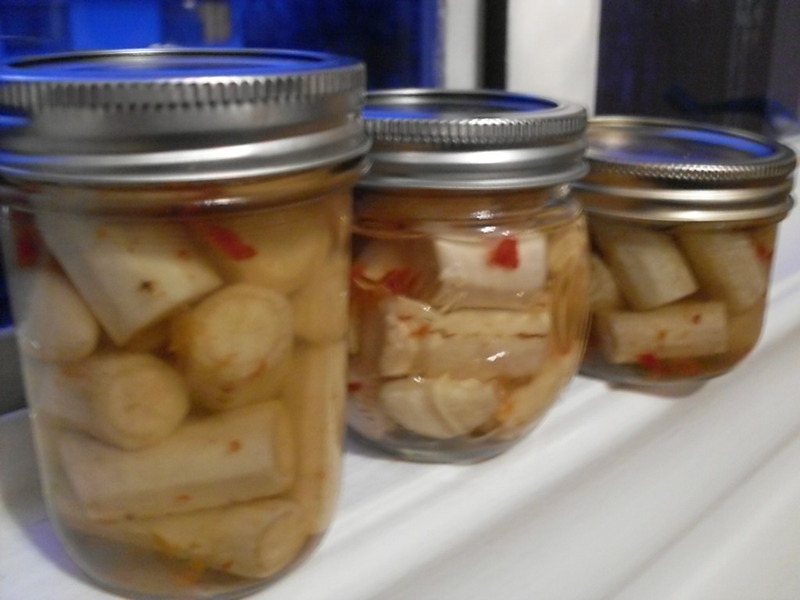 So, lest you think I am being evasive and not sharing the magnificent joys of burdock root, I pickled it. All eight feet, which amounts to three little jars of spicy, garlicky pickles, all cooling on my windowsill. They’re a lot like carrot pickles, which is exciting. Actually, they’re a lot like David Liebovitz’s carrot pickles, because I adapted the recipe from his site. Except that instead of two cloves of garlic smashed, I used four whole cloves of garlic per jar, and instead of cider vinegar, I used rice vinegar and a tasty drop or ten of mirin. ALSO, they’re spiced with one minced hot red pepper, and not fennel. Pretty good, at least based on the initial round of tasting – once they’ve stewed in their juices for three to six weeks, I am sure they will be awesome. So there you have it. Follow through, late as usual, but enthusiastic nonetheless. < Previous Another easy pizza crust, perfect for something unpleasant like Wednesday. Next > Tangelo Tart: Not just an amazing stripper name.